Everyone knows that John Kerry donned camos and went goose hunting yesterday. I thought it was embarrassing. Of course, Cheney made sport of it. But you won't see George W. Bush hunting for birds as a part of the campaign. His own photo-op dove hunt in 1994 while running against hunter and marksman Ann Richards for governor of Texas went wrong. 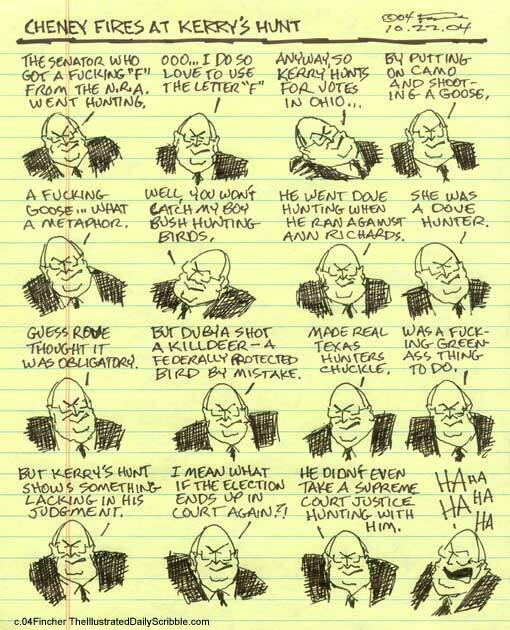 Apparently, Rove thought that Bush couldn't let Richards be more Texan than him and sent Bush out to hunt doves. Bush mistakenly shot a federally-protected bird called a killdeer thinking it was a dove. He paid a fine for doing so, and I remember friends who hunted laughing about the matter. Here's a link to Bush's photo-op disaster: Songbird Protection Coalition.